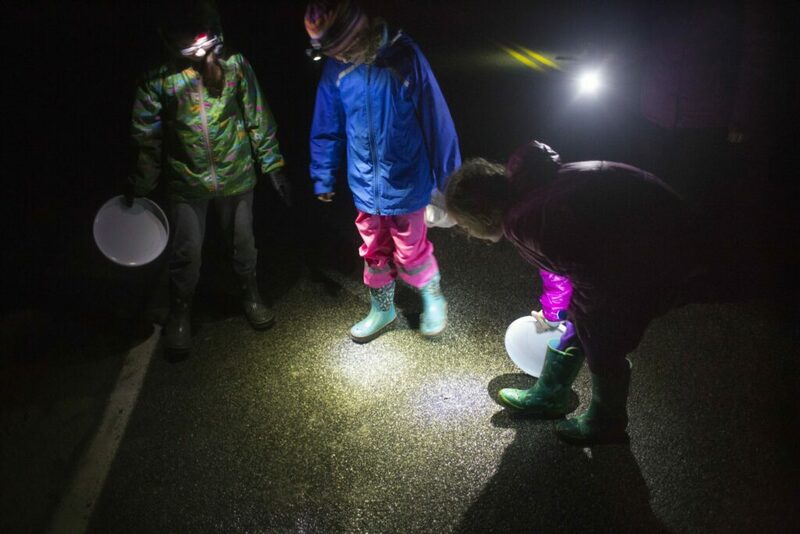 Volunteers came Sunday to help frogs and salamanders cross Range Road, but the most movement likely happened after midnight, when the human visitors were gone. CUMBERLAND — It would have been much appreciated if the guests of honor had shown up on time and in droves as everyone hoped. Alas, the wood frogs, spring peepers and yellow-spotted salamanders apparently had their own schedule to keep and didn’t fully cooperate with the 10th annual Frog Night, hosted Sunday by the Chebeague & Cumberland Land Trust. 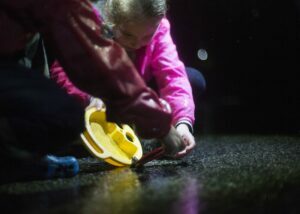 Wearing their best rain gear and carrying flashlights, about 50 parents, children and other townspeople gathered just after dark on Range Road, between Frog Pond and Salamander Swamp. The vernal or spring wetland is at the edge of the 216-acre Rines Forest, a town-owned recreation and conservation area. Their aim was to ensure that hundreds of amphibians would make it across the road unscathed during the annual spring migration, when frogs and salamanders that spend most of the year in the upland forest return en mass to the pond of their birth to mate and lay eggs. Police officers closed a short stretch of the rural road to keep everyone safe. Similar events are held each year across the Northeast from late March to late April. Land trust members had been watching local weather forecasts for days and pegged Sunday night for the likely migration across Range Road, despite a small culvert that connects Salamander Swamp to Frog Pond. Ice on the pond retreated last week, the outdoor temperature was forecast to be well above 40 degrees (it ended up around 50), and it was supposed to start raining shortly after nightfall – perfect conditions for the migration and a community learning experience born out of compassion and necessity. Lydia and Clara Hasbrouck, 7-year-old twins, had a clear sense of purpose when they arrived at Frog Night just after 8 p.m. with their parents, Nathaniel and Elizabeth, and their younger brother Noah. “We’re here because amphibians are going to cross the road,” Lydia said. And why was their help needed? “Because cars might run over them and they’d die,” Clara said. 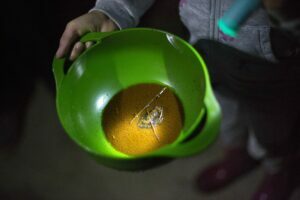 Excitement began to build as children foraged for frogs and salamanders in the swamp – headlamps and flashlights flitting like fireflies in the woods – and carried a few across the road in small water-filled containers. Three-year-old Theo Kailjala watched his father, Tim, crouch beside the pond and release a wood frog, which hopped directly into the water. “That’s what they like to do, Dad!” Theo exclaimed. It started to drizzle after 9 p.m. Children squealed with delight and gathered around to observe each capture. Older kids giggled when they saw one frog climb on top of another. A few spring peepers and wood frogs could be heard chirping and croaking in the pond, but nothing like the chorus that erupts during a mass migration. 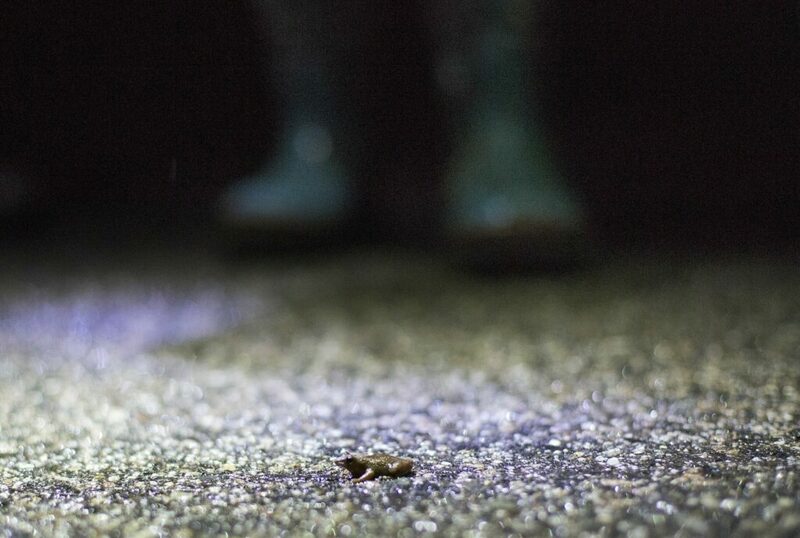 Laura and Jason Record stood in the darkened road as each of their three children – Riley, 11; Kelsey, 9; and Colin, 6 – caught a frog in the swamp and carried it to the pond. Their kids came with amphibian experience, having caught them regularly at the family’s lakeside camp. As the night wore on, anticipation of the mass migration increased. “They say it’s quite spectacular to see when they cross the road all at once,” Laura Record said. Unfortunately, steady rain held off until after midnight, when trust members and volunteers had gone home, so the mass migration occurred largely unobserved – but also when there was little traffic, so the assistance was less necessary. Similar annual migration assistance events are held across the Northeast, including in Bridgton and Unity, said Phillip deMaynadier, Ph.D., a wildlife biologist and amphibian expert with the Maine Department of Inland Fisheries and Wildlife. He believes they have a few major benefits. 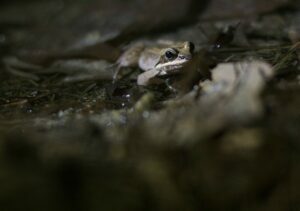 Frog Night also raises awareness of wildlife in general and the importance of preserving natural habitat, deMaynadier said. He described relatively common wood frogs, spring peepers and yellow-spotted salamanders as “ambassadors” for other more rare creatures that warrant greater concern and protection. In the process of assisting more common amphibians, he said, people might save a rare blue-spotted salamander, which is listed as a species of special concern in Maine, or an uncommon four-toed salamander. Frogs and salamanders live within 500 feet to a quarter-mile of the pond where they were born and are driven to return for one to two weeks each year, deMaynadier said. After hatching, they disperse into nearby woods. Peepers are tree frogs with suction-cup toes that help them climb. Wood frogs and salamanders live in leaf litter on the forest floor. Both frogs and salamanders fill a vital spot near the bottom of the food chain, deMaynadier said, as favorite meals for snakes, turkeys, barred owls, foxes, raccoons, broad-winged hawks, coyotes and other creatures. Events like Frog Night help people understand the need to protect spring wetlands where amphibians are born.